We’re well aware that we need to be cautious calling a place off the beaten track. It’s such an overused term. Besides, there’s usually a track to wherever we want to go nowadays. 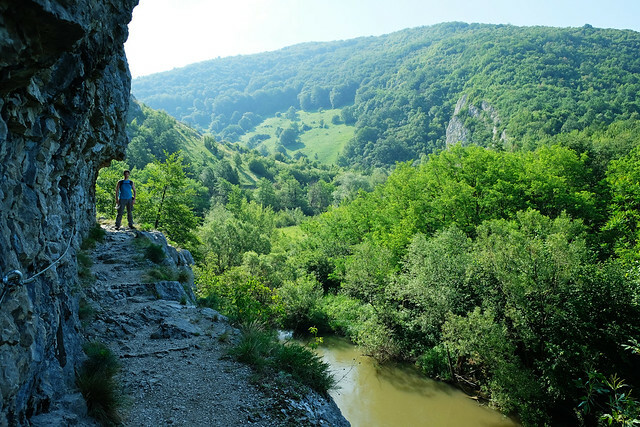 But in case of Nera Gorge-Beușnița National Park, we call it “off the beaten track” with the utmost confidence. After all, there’s barely any road to this park. Maybe the place itself exists only in the past. But where exactly? Nera Gorge-Beușnița National Park (Parcul Național Cheile Nerei-Beușnița in Romanian) is located in Caras-Severin county, in southwestern Romania. It’s the land of unique blue karst lakes and other karst phenomenon, caves and tunnels, and Romania’s longest gorge. And waterfalls. Not very high, but very pretty ones, lots of them! Hiking in this park is rewarding and easy due to the low altitude differences. Reaching the trailhead was usually the most challenging activity of the day for us, because roads are of very bad quality. Driving past Oravița towards the tiny villages of Sasca Română and Sasca Montana is just a nightmare. We had the feeling that the only real function of the road there is that something should contain those large potholes. We drove very slowly and carefully to not damage our car. Roads to Anina and Bigăr Falls (on the opposite side of the park) were the exceptions. Road 57B is fine, it’s the usual winding road through a lovely landscape with hills, forests and small villages. Not that the landscape is not lovely on the western side of the park. But our attention was focused on the potholes. Once we parked our car and ventured out on the trails, there was no more things to complain about though. 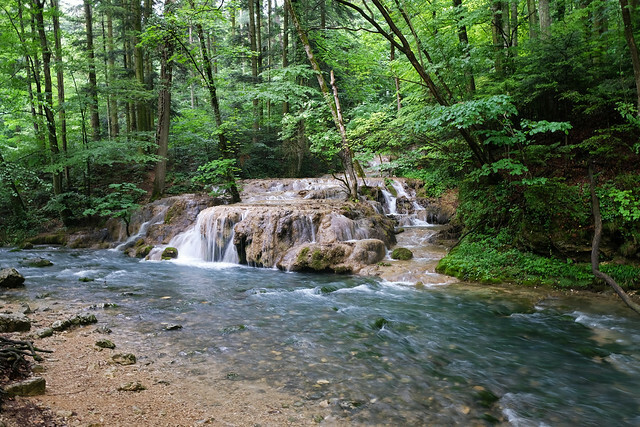 Sooner or later we always ended up walking along a crystal clear stream with travertine cascades and deep blue pools. The national park has two unique karst lakes, Ochiul Beiului and Lacul Dracului (Devil’s Lake). Ochiul Beiului is only about 3 meters deep. 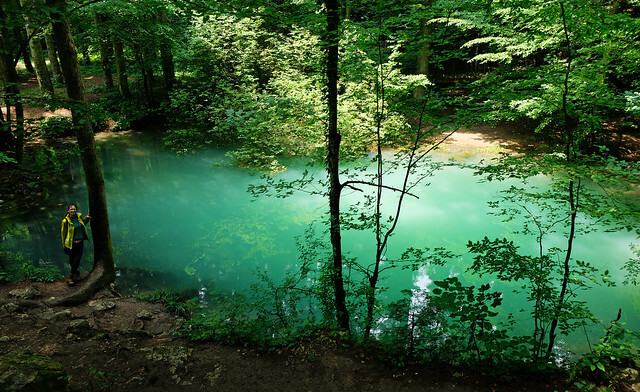 Its water comes from a karst spring, that’s why it has a very spectacular milky blue color. Also, it never freezes. Lacul Dracului is 12 meters deep, and it was formed after the collapse of a cave. We can’t tell much about its color though, because we couldn’t reach it in the end (more on that later). 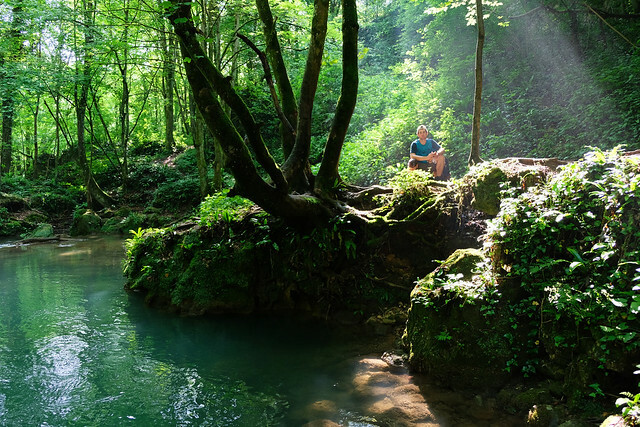 We found several pretty waterfalls on each trail we explored, four of which has proper names, too: Beuşniţa, Văioaga, Şuşara and Bigăr – the latter is the most famous one. We spent two and a half days hiking in Nera Gorge-Beușnița. We explored several shorter and longer trails, and now we know which our favorite route is (hah, rare occasion). It can be put together from parts of the routes that we’ve done separately. If we have to choose only one hike in this park, this would be it. It’s a full-day hike though, especially if you spend some time at each waterfall. So what’s this route? It includes the picturesque path through Nera Tunnels, and the prettiest walk with Ochiul Beiului lake and three waterfalls on the way. It starts from Sasca Romana. There’s a road sign indicating the “Tunnels”. Follow that, but don’t expect a signed parking lot or trailhead. We just left our car at the end of the village where we could find space. You should look for the suspended bridge then. Cross the suspended bridge on Nera. Then look for the red stripe sign that leads you through the tunnels. It’s the most scenic section of the Nera Gorge hike, and it lasts until Podul Bei. Oh, don’t forget to stop regularly to enjoy the views and take tons of pictures. By the way, Podul Bei is accessible by car, as well. You can drive even further into the park, however there’s an entrance fee for using that road. After Podul Bei our perfect hike leaves Nera Gorge. The yellow stripe is the mark to follow from there, and it runs along a crystal clear stream in the forest. Văioaga Falls was our first stop. We walked down to the very bottom of the falls for the best views. After about 45 minutes, we bumped into another waterfall. It’s a larger one with several cascades, still we couldn’t even figure out its name. Whether it has a name at all. It would deserve one. 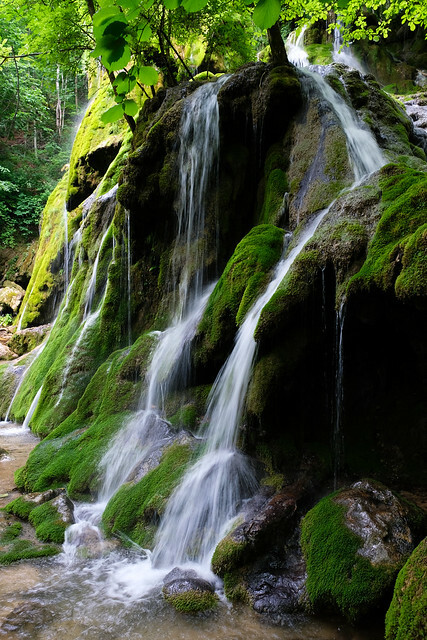 If you feel sorry to leave it and continue your way, we let you know that Ochiul Beiului lake is a couple of hundred steps from this waterfall. This lake is the most wonderful thing in the park. Period. Finally, we left Ochiul Beiului behind, as well. 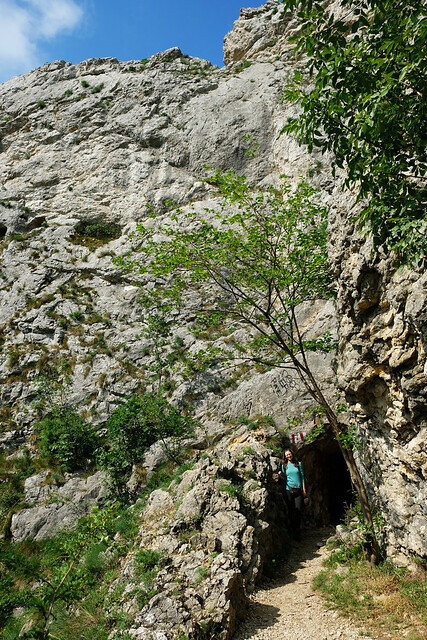 The trail goes on, to 12 metres high Beuşniţa Falls. 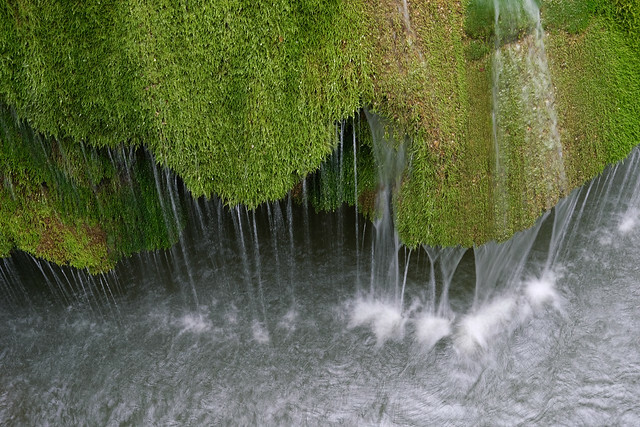 It consists of several smaller cascades on the large, mossy cliffs, and it’s worth walking around to see it from as many angles as you can. 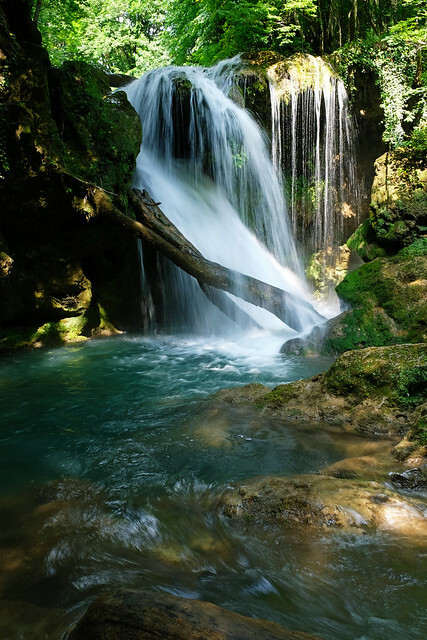 Photographer’s challenge: I found it very hard to capture the beauty of Beuşniţa Falls. Taking a picture of the whole waterfall is almost impossible, because there are so many cascades on each of its sides. Finally, I liked some of those shots the best that were taken of parts of it. 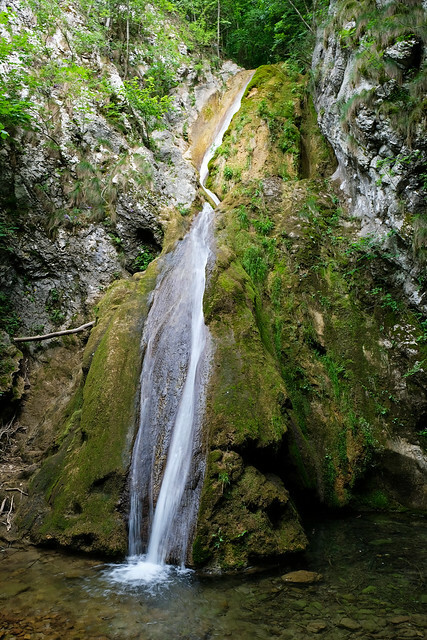 Of all the fabulous waterfalls of Nera Gorge-Beușnița, Bigăr is the easiest to access (5 minutes walk from the parking lot), and also the most popular to visit. The uniquely shaped rocks covered with moss and lichens reminded us of a large mushroom. Unlike all the above mentioned attractions that are in the western area of the park, Bigăr is located in the northeastern area. No hiking trails start from there, so it makes sense to add it as a stop in the beginning or at the end of your trip. Nera Gorge is one of the wildest gorges in Romania. 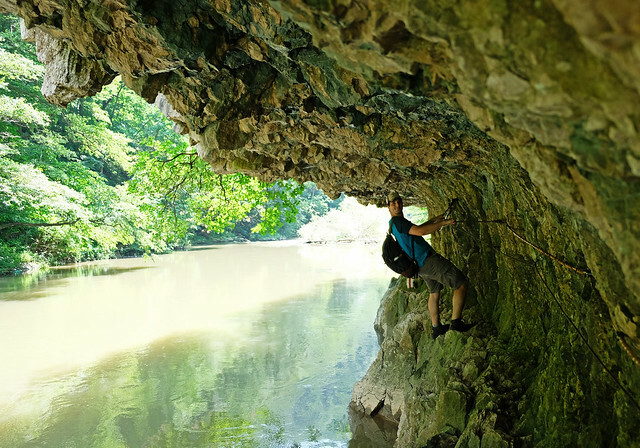 We’ve already mentioned the hike in this gorge that starts with the tunnels. Well, this hike is actually a very long one if you do it all the way. From Sasca Romana to Sopotu Nou, it takes almost 2 days to complete. About halfway, you can find Lacul Dracului, the other unique lake of this national park. Our plan was to hike to the lake from Sasca Romana and back as a day hike. What we didn’t know is that a couple of kilometres before reaching the lake, there’s a crossing on Nera River. I mean there’s a sign that obviously indicates that the trail continues on the other side, but there’s no bridge or rope. 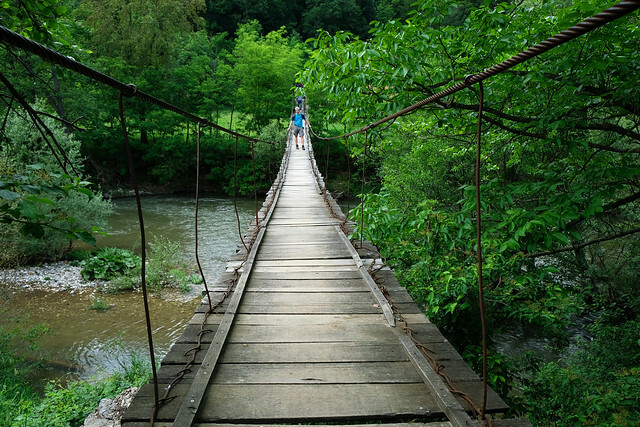 We assume you should just take off your shoes and cross the river. Maybe you can do it in August, but we couldn’t do it in May. The river was way too deep to cross. So that was the point to turn back. The walk along Nera is nice (it’s not your crystal clear river though, it was quite muddy that time of the year), there were some impressive rock walls along the way, still we were a bit disappointed. The highlight for this hike would have been Lacul Dracului. 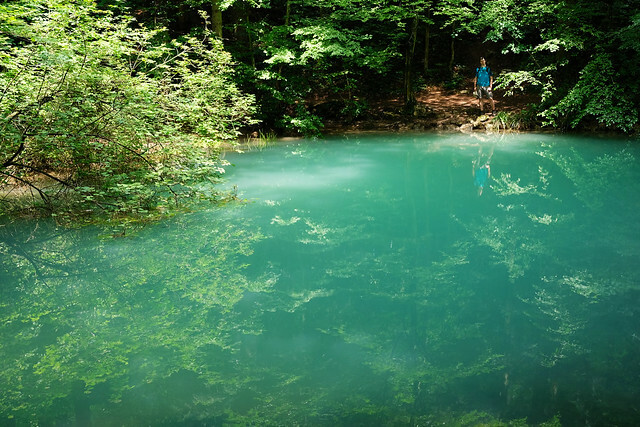 As we figured out, there’s another way to access this lake: driving past Podul Bei on a narrow forest road, then taking the trail marked by blue stripes to Lacul Dracului. If we would have known earlier… So we didn’t see Lacul Dracului in the end, but found a short hike to another fairy tale waterfall. 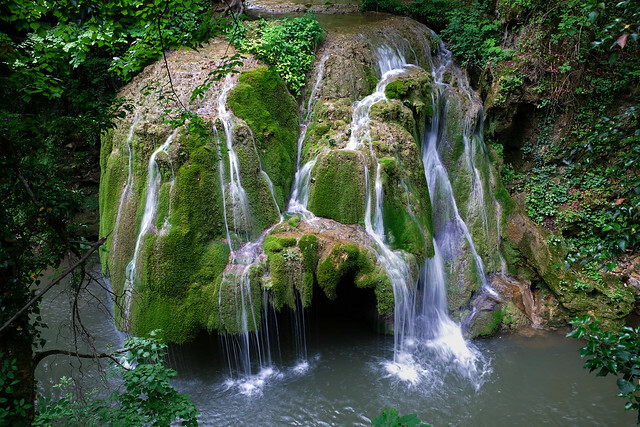 If you’re looking for a hiking trail that’s short, easy and rewarding, it’s the trail to Şuşara Falls. It runs along Şuşara stream that’s a perfectly clear stream with lots of small cascades and pools. The only challenging part is a short canyon where chains helped us to cross the shallow stream. It was fun. 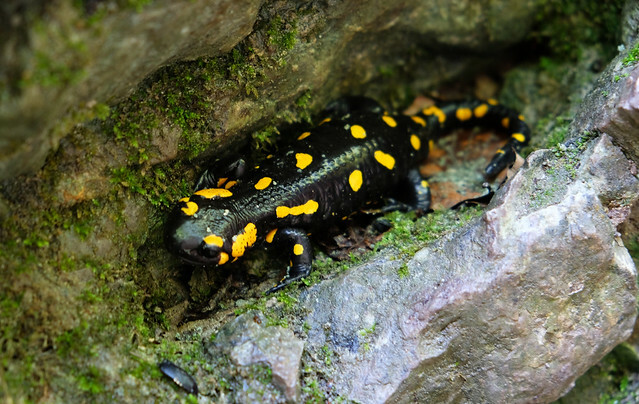 In addition, we’ve seen a Spotted Salamander in the canyon. Şuşara Falls is at the end of this trail. It’s 15 metres high, and drops down in two cascades. The large rocks around the pool make for a perfect picnic spot. So, here’s another proof that this national park is off the beaten track: accommodation is scarce in the area. We couldn’t find too many options online. Sasca Montana is a very small village, and those few rooms that we found online were sold out. They would have been the ideal place to stay though, because Sasca Montana is close to all the trailheads in that area. We ended up staying in Reşiţa. It’s a larger town, still I couldn’t say we had too many options. But the worst was driving about 1.5 hours twice each day on those bad roads. If you’re more adventurous, you can choose to sleep in a tent. In Camping Valea Beiului, or in any clearing you find suitable – as long as you leave the area as you have found it. Do you have a favorite lesser known national park anywhere in the world?